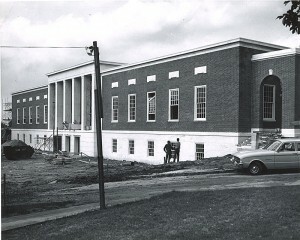 In 1961, following several years of planning, the Trustees approved the construction of a new library facility at Homewood, and settled on the open end of the Keyser Quadrangle, facing Gilman Hall, as the ideal location. 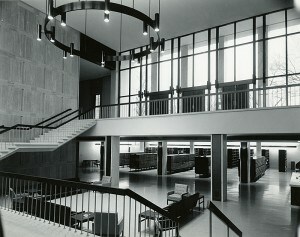 Architects Wrenn, Lewis, and Jencks proposed building the library primarily underground. Were such a structure to be built above ground, they felt, its size would dwarf nearby Homewood House. Completed in 1805, Homewood House (now the Homewood Museum) is an excellent example of Federal period architecture. The University had decided in the early 1900s to follow this example for future construction and the architects did not wish to abandon that plan. This decision to place the library underground gave rise to two enduring legends. These legends presumed that Daniel Coit Gilman left instructions in his will specifying that no structure could rise taller than Gilman Hall, or that nothing could obscure the view of the Gilman clock tower from Charles Street. Neither of these legends has any foundation in truth. The construction of the new library is well documented through photographs showing first an empty hole, then a structural steel framework, followed by floors and walls enclosing the building. Contractors encountered problems with an underground stream that had to be diverted, as well as the immense pressure of the ground against deep exterior walls. A new type of structural steel solved the latter problem, allowing less internal bulk and resulting in significant cost savings. In December 1963, Ex Libris devoted an entire issue to describing the new building. In August 1964, staff began moving over one million volumes across the quadrangle from Gilman, and on November 7, 1964, the new library was formally dedicated. In April of the following year, supported by faculty, students, and friends of the University, the Trustees named the new library in honor of President Milton S. Eisenhower. One important difference between the new library and the previous facility was the consolidation of departmental libraries. Despite opposition from some departments, it was more efficient to maintain books in one location rather than to group materials in various buildings according to area of study. With increased emphasis on inter-disciplinary study, divisions between scholarly disciplines became less important. Library director John Berthel retired in 1973 and David Stam assumed the directorship until 1978. Stam was succeeded in 1979 by Susan K. Martin, followed by Scott Bennett in 1989. Bennett was named director of the Yale library in 1994 and James G. Neal succeeded him a year later. When the Eisenhower Library opened in 1964, adequate space seemed assured until well into the Twenty-First Century. As in the past, however, the building filled up more rapidly than anticipated; by 1979, space was again at a premium. By necessity, study areas were converted to shelving, and corridors on the stack floors were narrowed to extend each shelf range. These were understood to be stopgap measures and several plans were considered for expanding the existing structure. In 1988, the library celebrated adding its two millionth book. In 1995, anticipating that electronic access and digital media would slow the growth rate of the book collection, the University leased an off-campus warehouse. Thirty-one years after the Milton S. Eisenhower Library opened, another major shift began, transporting underutilized books and microfilm, as well as manuscripts and university archives, to a satellite facility on Moravia Park Drive. In conjunction with this shift, work began on a long-overdue renovation of levels M, A, and C in the Eisenhower Library, streamlining the existing space to better accommodate the collections as well as growing numbers of staff, students, and faculty. In 1998, through the generosity of Mr. and Mrs. R. Champlin Sheridan, the library’s endowment received a major boost and in recognition, the Sheridan Libraries were created, comprising the MSE Library, the Hutzler Undergraduate Library (the “Hut”), the John Work Garrett Library at Evergreen, and the George Peabody Library in Mount Vernon. When the Moravia Park facility became overcrowded, planning began for a larger, purpose-built facility, which opened on the campus of the Applied Physics Laboratory in November 2005. The Libraries Service Center now offers an expandable space to accommodate growing collections, both books and manuscripts, in controlled environmental conditions. In 2001, James Neal left Hopkins for Columbia University, and Nancy Roderer, Director of the Welch Library, served as Interim Dean for one year. In 2002, Winston Tabb was named Dean of the Sheridan Libraries (now, Dean of University Libraries and Museums). Soon after taking over, he made it a priority to expand the campus library facilities, and from this came the planning and construction of the William R. Brody Learning Commons, which opened in August and was formally dedicated in October 2012. The BLC is intended to facilitate individual and group study, replacing some of the study space that had been lost over the years in the Eisenhower Library building.